San Sebastian Pintxos o No? Let’s just say that the pintxo tradition is strong here. Every night in San Sebastian is a fiesta, with streets boiling over with so many plate holding patrons, it’s difficult to discern who belongs to what restaurant. Conversely, markets are few.. Do the locals even eat at home in San Sebastian? 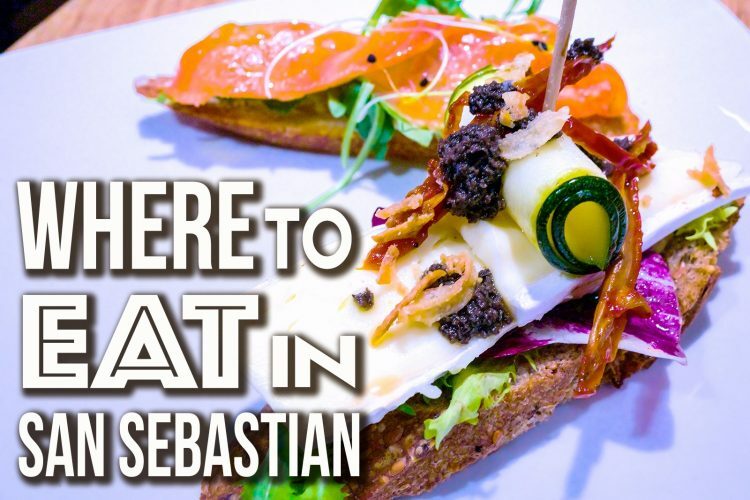 This may sound crazy, but by day two in San Sebastian, and nearly two months of Spanish eating under our belts we needed something other than San Sebastian pintxos. At this point, we’d rather eat McDonald’s than elbow through another crowd, only to eat standing on the street. So we walked, and looked, looked and walked.. Palatable, seat-bearing restaurants were packed, so we walked and looked, looked and walked… Almost two miles we walked through San Sebastian. And Big Mac beckoned: “Two all beef patties, special sauce, lettuce, cheese, pickles, onions on a sesame seed bun..” One final effort: a darkened cafe, dead-end alley, an empty table for dos, an understated relief..
A defacto meat-eater of sorts, I was slightly distressed when handed a vegetarian menu when we finally settled on Tedone. But a seat, a waiter, and no Mickeedees!? Worth a shot, for sure, and upon locating the peces de la dia, we happily ordered the hake and shrimp offerings. Dos vinos blancos, our hunger-induced stress began to melt away, and in short time we were greeted with sublime plates of wonderfulness.. Whether it be our quenched hunger and thirst, the fact that we were seated and served, or the fresh-caught seafood was paired with expertly seasoned greens, our walk and hunger was worth it all.. If you’re planning to visit San Sebastian, you might want to check out our San Sebastian resource page. All your photos are AMAZING! They could be in Life Magazine or National Geographic. Really good! !